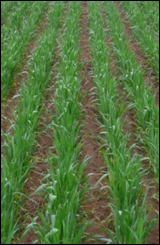 South Australian farmers manage a challenging climate; a warming and drying trend will increase emphasis on matching crops to the environment and improving the efficiency of water use. Warmer and drier conditions will change the spectrum of pests and disease due to less rainfall and changes in the range of crops grown. The Primary Production Research Group looks at current conditions in areas with similar climatic conditions to those projected under various climate change scenarios, and assesses their usefulness for understanding potential impacts and adaptation options available to our rural industries. The work of the Terrestrial Primary Production Research Group is closely aligned to government policy. 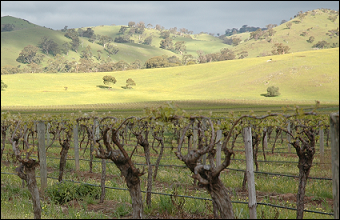 Experimental sites range from southerly Belair in the Adelaide Hills to Orroroo in the north, with several sites across the Eyre Peninsula. Locations are paired to reflect differences in growing season temperatures which are aligned to current climate change predictions. The development (phenology) of wheat follows a well defined series of events and is sensitive to small changes in temperature. Farmers adapt to the environment by seeking to maximise the length of the growing season, and by avoiding frost at flowering and the drying conditions of late spring. The Primary Production Research Group are measuring field temperature and monitoring the development of several wheat varieties including ‘Axe’, ‘Gladius’ and Yitpi’. Real observations of wheat phenology are being compared to those predicted by the simulation model APSIM. Plant diseases such as Yellow leaf spot of wheat (Pyrenophora tritici-repentis), Blackspot of field pea (Mycosphaerella pinodes), and Net Form Net Blotch of Barley (Pyrenophora teres f. teres) are all spread by windborne fungal spores. These pathogens can severely affect yield and profitability of agricultural cropping systems and their dispersal patterns can be correlated to temperature and rainfall. A trapping system for wind dispersed spores of fungal diseases is being employed which uses the unique DNA finger print of each pathogen to accurately identify it. In addition, the incidence of lesions on trap-plants (susceptible varieties of wheat, barley and peas placed adjacent to spore traps) is being correlated to the identified spores in order to validate the results from the DNA fingerprinting. The differences in growing season temperatures between matched sites are within those predicted to occur within the next 20 years. Within sites, small variations in climatic variables (meso-climates) are analogous to changes expected under very minimal changes to our climate. Hence, data collected by the Primary Production Research Group will provide an indication of wheat development responses to a range of potential climatic shifts. These data can then be used to proactively influence on-farm adaptation strategies, maximising our capacity to cost-effectively farm wheat under a wide range of possible future environmental conditions. 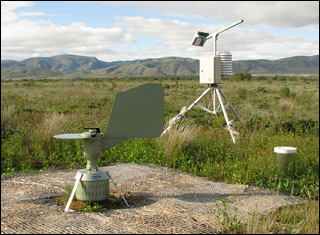 Data generated on the dispersal patterns of fungal pathogens will be correlated to climatic data. Variability in pathogen behaviour will be used to link to the variability between sites and generate data to be used in the development of disease predictive models. These techniques allow us to examine the influence of climate on the timing and severity of disease epidemics and support the creation of early warning systems so that growers can apply strategic disease management. Click here to see the location of the terrestrial primary production transects in South Australia.